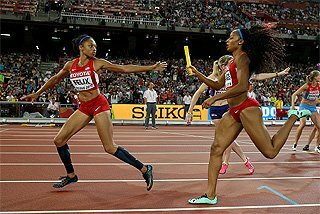 The indoor hall in Karlsruhe has always been a good sprinting venue, and in keeping with tradition, two of the three world-leading marks in Sunday’s (13) 27th BW-Bank Meeting – an IAAF Indoor Permit Meeting - came in the short races. 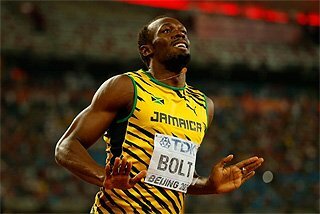 Early in the programme, the quick Karlsruhe sprint infield had begun to work its magic, as 34-year-old Kim Collins of St. Kitts, the 2003 World champion in the 100m, showed that there was still plenty of life in his legs with a 6.50 world-leading heat clocking in the men’s 60m. Collins wasn’t able to replicate his performance in the final, however, as Jamaica’s Lerone Clarke moved to the front in the second half of the race and posted a PB 6.52 ahead of Trinidad’s Mark Burns’ 6.56, also a personal best. [Clarke also posted a PB 6.54 in the preliminary round.] 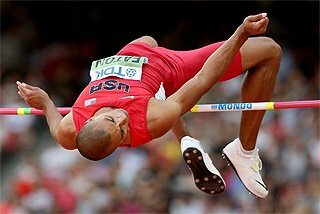 Mike Rodgers of the US suffered the ignominy of a false start and could not be part of the mix in the final. It was later confirmed that Collins strained a groin muscle halfway through the final and is now heading back to his base in The Netherlands for treatment. 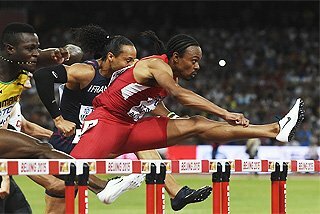 The men’s 60m Hurdles was greatly anticipated with an expected duel between American David Oliver and China’s Liu Xiang. Sending a signal with a 7.48 clocking in the heats, Oliver broke away from early leader Dmitri Bascou of France and scored an easy win in 7.40, as Bascou followed strongly into the wire in a PB 7.53. Liu, in only his second start of the season and seemingly not yet back in top form after his injuries the past several years, was third in a still-creditable 7.55, with another French hurdler, Garfield Darien, also lowering his all-time best to 7.56 after having equaled it with 7.62 in the heats. Oliver, who was seen walking irregularly after the race, injured his right calf right at the finish of the hurdles as he pushed hard for a good time. He is now en route to Munich for treatment. With Olesya Povh withdrawing after straining a hamstring during warmups, her Ukrainian teammate Mariya Ryemyen jumped into the void and came away with a PB 7.15 win in the 60m, as she was pushed all the way to the wire by Norway’s Ezinne Okparaebo in 7.17, also a lifetime best. Germany’s Verena Sailer, the European 100m champion in Barcelona last year, was making a delayed season debut after lower back pains had hampered her indoor progress. 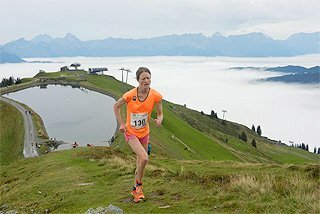 She finished a distant third in 7.28. 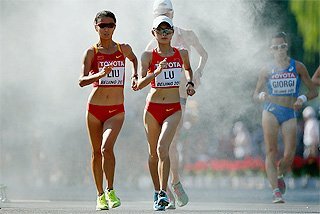 For sheer entertainment value, the women’s 3000m was perhaps the best of the programme, as the lead changed three times in the final two laps. In the end, it was Mercy Njoroge, the Commonwealth silver medallist from last year, repeating her Stuttgart win with a world-leading 8:42.75. Sara Moreira of Portugal moved to the front with 400 left as erstwhile leader Mekdes Bekele of Ethiopia dropped back. Then at the bell, Poland’s Sylwia Ejdys sprinted ahead, only to draw a final gasp effort from Bekele. 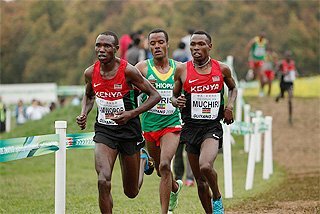 Neither runner could withstand the determined finish of Njoroge, however, as the Kenyan came from fourth place to take the win in the final 150 metres. Personal-best times came from Ejdys (8:43.22), Moreira (8:44.22) and Bekele (8:44.25) in the next three spots. Gideon Gathimba of Kenya outkicked Azerbaijan’s Hayle Ibrahimov to win the men’s 3000m in 7:41.77, a PB by almost eight seconds. 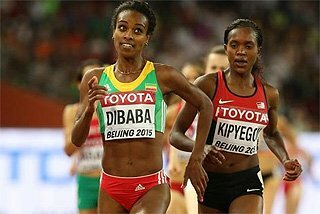 The compactly-built Ibrahimov, who was the bronze medallist in the 5000m last summer in Barcelona, had held the lead for most of the race, but the Kenyan sprinted past with 350 to go. 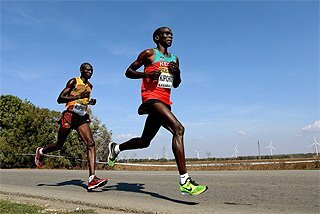 Ibrahimov stayed close to Gathimba until the final 100 metres, but he could not deal with the Kenyan’s final strides. Ibrahimov’s 7:42.54, also a career best, held second with Hais Welday of Eritrea (7:46.03) fending off France’s Yoann Kowal (PB 7:46.19) for third. Silke Spiegelburg continued her fine season with a 4.76m German record in the women’s Pole Vault as now only Yelena Isinbayeva has jumped higher this year. 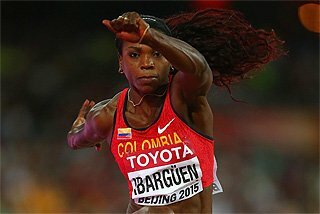 After a bit of uncertainty which produced a run-through on her second attempt at the record height, the Barcelona silver medallist succeeded magnificently on her final attempt but did not continue. Aleksandra Kiryashova of Russia took second at 4.61m on a countback against German Kristina Gadschiew. Spiegelburg had to overcome an earlier problem when she missed twice at 4.61m, as the Russian cleared on her first attempt. 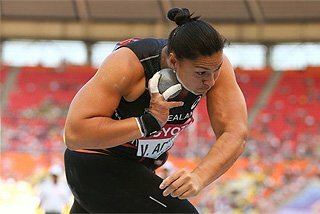 Passing to 4.66m, she cleared on her only remaining try and that opened the door for her record attempts. The current World junior silver medallist in the men’s 400m, Hungary’s Marcell Déak-Nagy, posted the best time of 47.10 in the two sections of the men’s 400m. The lean 19-year-old grabbed the curb position after the opening lap (22.23) and held off German Marco Kaiser (47.57) and Barcelona bronze winner in the 400m Hurdles, Stanislav Melnykov of Ukraine (47.58). The other section was won in the final 40 metres by Germany’s David Gollnow (=PB 47.29) as he overtook Roman Smirnov of Russia (PB 47.39). The Russian clocked 22.04 for the first lap but faded significantly in the final stages. In the second of two timed heats of the women’s 400m, Czech Zuzana Hejnova grabbed the pole position over France’s Muriel Hurtis after the first lap and accelerated strongly over the last 80 metres for a 52.86 win, as Hurtis came to the finish in 53.93. The first section saw Marta Milani of Italy winning in 53.89. The men’s 1500m was won by Kenya’s Bethwel Birgin in a PB 3:35.38 over Mehdi Baala of France (3:35.97). The second designated pacemaker, Collins Cheboi of Kenya, predictably dropped away from the leaders with 300 left. 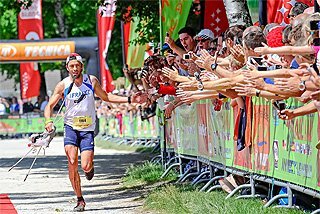 However, in an unusual move, he did not leave the track but instead continued to the finish, taking third in 3:37.36. The men’s Long Jump turned into a close encounter for the podium positions, as Ignisious Gaisah of Ghana saw his second-round 7.97m hold up for a narrow win over Louis Tsatoumas of Greece (7.96m also in the second round) and Germany’s Sebastian Bayer (7.95m on his opening jump). The women’s High Jump was won by season leader Antonietta Di Martino of Italy with 1.92m in a countback against Viktoriya Klyugina of Russia. After her 2.04m on Wednesday in Banská Bystrica, the Italian was clearly still recovering from her landmark performance.